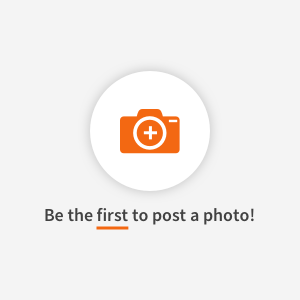 Find healthy, delicious black eyed pea recipes, from the food and nutrition experts at EatingWell. 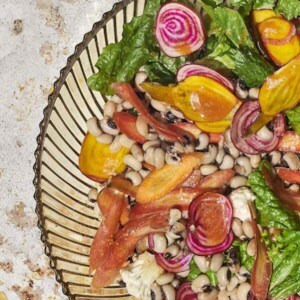 This southern-inspired black-eyed pea salad with zesty chili peppers is meant to be served warm but can also be made a day in advance and served cold. Try serving this versatile recipe as a dip with chips or crackers. Floribbean dishes often use a lot of peppers, but their spiciness is moderated by gentle flavors such as key lime, mango, almond or honey. 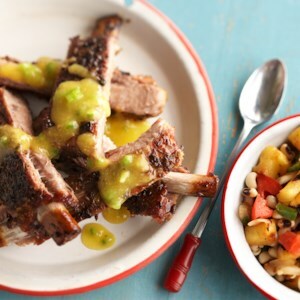 The ribs in this recipe are flavored with a spicy-sweet mango sauce and served up with a fresh grilled pineapple salsa that's chock-full of high-in-fiber black-eyed peas. 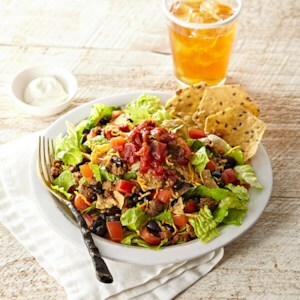 Taco salad doesn't always have to contain beef--this 15-minute version uses tofu or black bean crumbles, which taste delicious and offer up a healthy dose of protein. This vegetarian meal is so tasty that even meat-only eaters won't miss the beef. 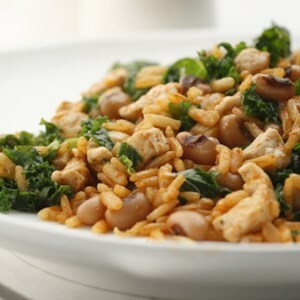 "Hopping John" is a southern pea and rice dish, also known as "Caroline Peas and Rice." 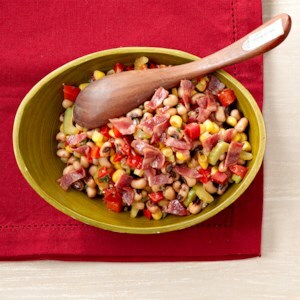 In this version, we've eliminated the rice and gone heavy on the veggies, combining black-eyed peas, sweet peppers and jalapeño peppers with herbs and spices, a molasses dressing, and a sprinkling of crumbled bacon. Try this recipe when you've got a craving for old-fashioned soul food. With a peppery Cajun-style rub and a black-eyed pea salsa, this roast recipe is perfect for New Year's Day. 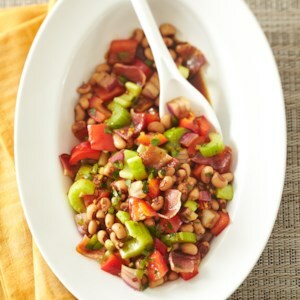 Southerners traditionally eat black-eyed peas on New Year's Day for good luck in the coming year. 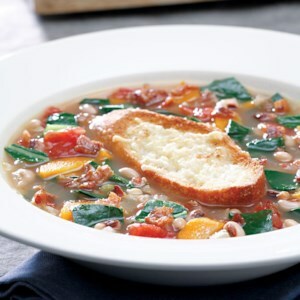 Antioxidant-rich collard greens and fiber-packed black-eyed peas have a starring role in this nutritious soup. There's no need for loads of ham or salt pork--just a small amount of bacon gives it a wonderful smoky flavor. You can skip the bacon and substitute vegetable broth for chicken broth for a great vegetarian dish. 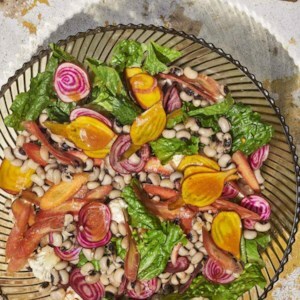 In the South, black-eyed peas and greens are traditionally eaten on New Year's Day to bring good luck and prosperity to the New Year. We like this stew anytime of year. 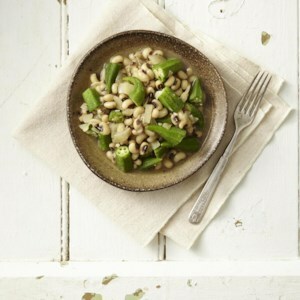 Make it a meal: Spoon the black-eyed peas over white or brown rice. For this sauté, soft, smooth black-eyed peas make a mellow match for the assertive flavors of dark leafy greens. Country ham or Italian prosciutto makes a nice change from the salt pork or ham hocks that greens are traditionally cooked with. In this black-eyed pea dip recipe, black-eyed peas are pureed with extra-virgin olive oil, red-wine vinegar, garlic and thyme--a nice alternative to hummus. Try this protein-rich black-eyed pea dip with your favorite fresh vegetables or baked pita chips. 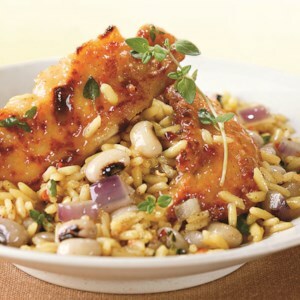 This boldly flavored spin on Hoppin' John replaces salt pork or bacon with lean pork chops. Plus we've added greens--in this case kale--a traditional accompaniment with the dish. Serve with cornbread and a glass of Spanish rioja. 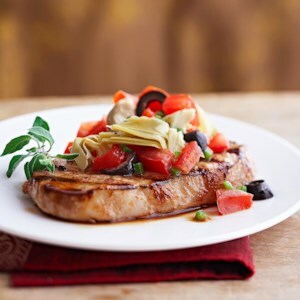 Frozen artichoke hearts are great to have on hand for just this type of easy salad. If you can't find frozen, go for the canned variety but keep in mind that they do have added sodium. You can rinse them under cool water to remove some of the sodium. This isn't any ordinary picnic pasta salad. Coffee and molasses add rich notes to the tangy dressing. 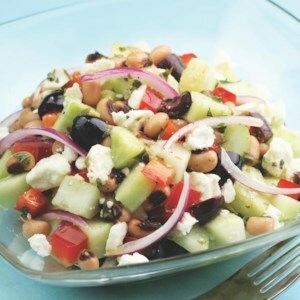 Need a little incentive to eat more vegetables? 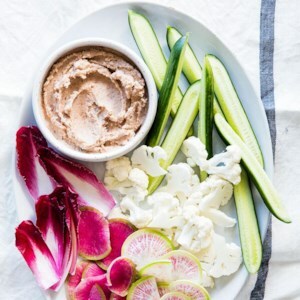 Keep this easy, healthful dip on hand--who knew that raw vegetables could be so addictive? 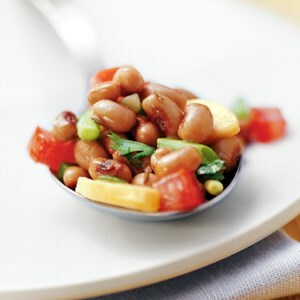 Serve this delectable, garlicky black-eyed pea spread with toasted slices of baguette as an appetizer.